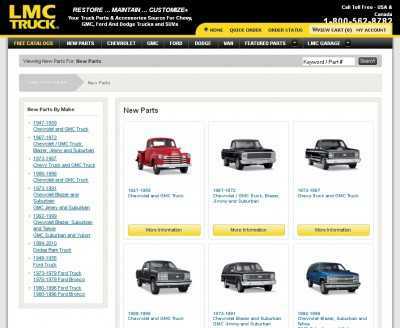 LMC Truck is a retailer of truck parts and accessories. 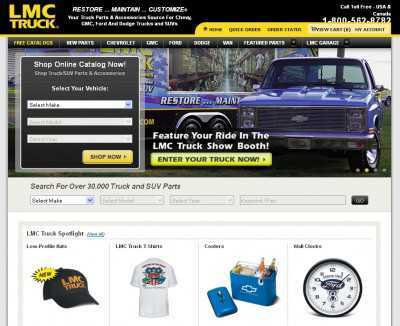 Its website is found at www.lmctruck.com, and if you visit it you’ll be able to easily browse through the company’s full catalog online. Parts and accessories for the following brands are available: Chevy, GMC, Ford and Dodge. All these makers are found on the site’s main navigation menu. And if you’ve got a SUV, then you’ll be glad to know that LMC Truck also carries items for your vehicle. And the company’s catalog can also be browsed in other ways. For example, you can see all the newest additions on the same page. And you can also see these items that rank among the company’s best-sellers, and know what other people who have got your very same vehicle all over the US are buying. Orders can be immediately placed; you can buy whatever you see and like on the spot. And then, track the status of your order here. 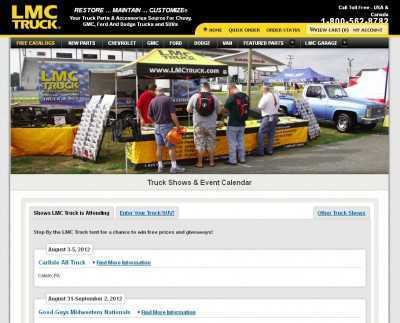 LMCTruck.com also features a section named “LMC Garage” in which you can find testimonials, videos and a photo gallery. And if you want to know about these fairs and automotive events that the LMC Truck staff is going to attend next, then you can also get that information on that part of the site. You’ll even be able to register your own vehicle for any event that sounds like good fun, and save your place there.